At the core of the pharmaceutical and agri-food industry's concerns, Pyrocontrole develops fast, reliable temperature measurement solutions adapted to meet the essential requirements of safety and traceability. A whole set of equipment with proven performance to guarantee precise temperature monitoring and avoid any risks due to unforeseen thermal variations. Applications: drug manufacturing, food manufacturing, cooking equipment, refrigeration equipment, conditioning, etc. Interruption of the cold chain, incorrect heat treatment, etc. Temperature measurement is essential to guarantee optimum quality. Pyrocontrole develops rugged, high-performance temperature sensors which fulfil the hygiene constraints of the agri-food and pharmaceutical sectors. >Applications: autoclave, refrigerated chamber, bath to be controlled, cooking checks, etc. 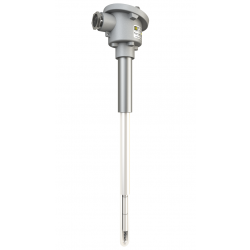 hygienic sensor for quick, accurate measurement of the temperature at the heart of the product without health hazards. this is mounted upstream of the control process and used to check the temperature of the system to be controlled. - Safety: independent of the heating system, its main function is to monitor the temperature. - Control; when connected to a controller, it adjusts the temperature throughout the process. - Duplex: 2-in-1 system which both measures and controls the temperature. To avoid any involuntary temperature variations and accurately monitor temperature over time, temperature controllers are essential. Capable of withstanding severe environments and cleaning with a water jet, the STATOP range of temperature controllers offers high precision for the adjustment parameters. These easy-to-use instruments can be handled without any particular knowledge of control. >Applications: autoclaves, furnaces, baths to be controlled, etc. IP65 controller equipped with the automatic action adjustment system: self-adjusting PID control mode. The STATOP 24-15 also incorporates fuzzy logic which performs automatic process recovery. IP65 controllers equipped with the automatic action adjustment system: self-adjusting PID control mode. They also incorporate fuzzy logic which performs automatic process recovery. The STATOP Series 60 controllers are equipped with a second input to command the control setpoint. In compliance with the strict health and safety standards, the Pyrotracer recording and monitoring solution from Pyrocontrole ensures advanced traceability of the temperatures and data protection in accordance with the applicable regulatory requirements. With its specific programs, it is an ideal tool for validating sterilization or pasteurization cycles. Applications: autoclaves, ovens, refrigerators: all temperature traceability processess. from recording the data to controlling the machines, the new CPS Touch® range of touch human-machine interfaces offers multiple advantages. Comprising 5 models, from the simplest to the most sophisticated, the CPS Touch® range is suitable for all supervision requirements. Equipped with a touch screen which can be used even when wearing safety gloves, a front panel which withstands cleaning with a water jet and a data protection system compliant with the stipulations of the "21CFR part 11" regulations, CPS Touch® integrates the constraints of the agri-food and pharmaceutical industries. >Applications: autoclaves, ovens, refrigerators, kneaders, mixers, furnaces, etc.